The Pacsafe Citysafe CS300 is probably the most secure daypack you can buy at a 15 liter capacity. Slash-proof internal meshing, RFID protection, and lockable zippers are all designed to prevent a brute-force attack on your backpack – but these protections might not be worth the added cost for every traveler. As you can see in my full video review above, the Citysafe CS300 is a compact daypack made specifically to protect against pickpockets and robbery. According to Pacsafe, the CS300 is a tech bag for women (the slightly larger CS350 isn’t sold as gender specific) but for a gear bag, the CS300 is pretty small. The Citysafe CS300 is more of a camera with some random stuff type of sightseeing backpack. Because it has an internal mesh to prevent a thief from cutting through the bag, the CS300 is actually better padded than most daypacks. One advantage being you won’t need an extra case for your camera or other gadgets when they’re in the Citysafe. The shoulder straps also can’t be slashed easily but all of this meshing means a heavier bag with less internal storage than regular daypacks. At .58 kilograms (1.28lbs) the CS300 isn’t a heavy backpack but does have a noticeable heft for a bag that’s only measures 35x26x16 centimeters (13.8×10.2×6.3 inches). Surrounding the mesh also means more padding at the expense of internal space. But the CS300 is a daypack you get for its security features, not carrying capacity. RFID blocking (here’s what’s on your passport RFID chip) may be important for some travelers, in which case, the CS300 has you covered. Although it has an RFID blocking pocket, the inconspicuously locking zippers are the CS300’s most practical protective feature. 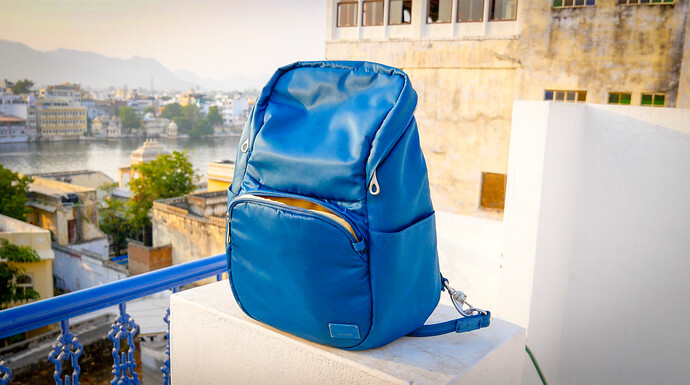 Slash and grab thefts aren’t likely to occur when you’re actually wearing your backpack – but sly pickpockets can easily slip into a bag in crowded areas though unprotected zippers. Aside from the cleverly locking zippers, all of the other protections like knife-proofing are good for piece of mind – without a lot of practical benefit. Your bag being robbed by a thief who cuts their way in is most likely to occur when your backpack is under your seat on a bus or overhead on a train. Crowded festivals? Keep your backpack in front of you. The Pacsafe Citysafe CS300 is good at being a backpack that thwarts pickpockets, bag slashers, and RFID hackers for a cost of around $100. Take away its extreme security features and the CS300 is an overpriced daypack. It’s up to you to decide whether or not complete bag protection is worth your money; though for roughly half the price you’ll get a more versatile bag in the Osprey Daylite Daypack. NextCan My Smartphone Replace A Dedicated Camera When Traveling?